Lawmakers in 27 states introduced nearly 100 transportation funding bills in January, and additional states are expected to do the same as more legislative sessions open this month around the country. 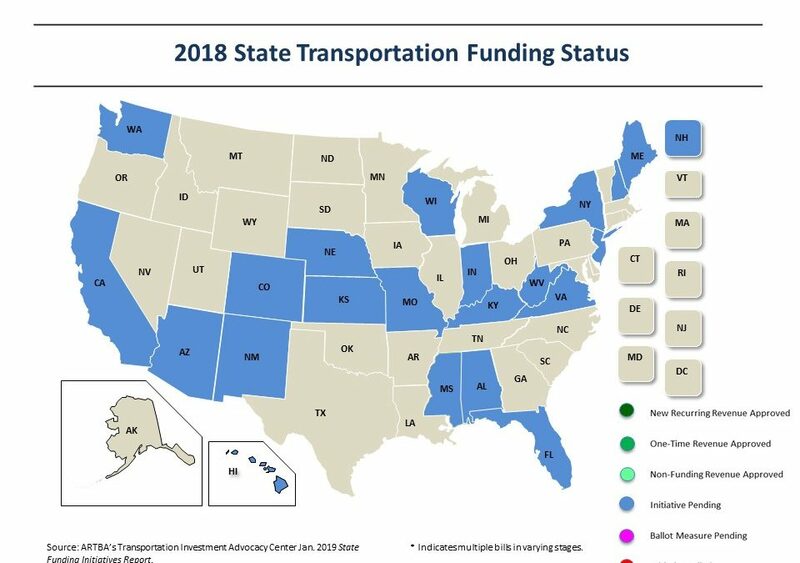 The January 2018 State Funding Initiatives Report from the Transportation Investment Advocacy Center™ (TIAC) provides in-depth analysis of current state measures and puts them in the context of national trends, including important background information. The report contains easy-to-scan narratives, graphs, and maps. Hawaii, Missouri, Mississippi, and Nebraska have proposed raising taxes on motor fuels. Eight states are considering registration fees for electric motor vehicles, and six of them also included hybrid vehicles in their proposals. Kentucky, New Hampshire, and New York have proposed road usage charge pilot programs to increase transportation funding. Other states are also exploring options outside of traditional transportation funding.